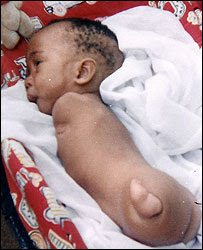 Kevadon, of course, is better known as Thalidomide. Putting his personal pocketbook and political aspirations above all else (common sense and decency included), Slick Rick's executive order making Texas the first state to mandate that all girls entering the 6th grade must be vaccinated with Gardasil is a shocking abuse of power. 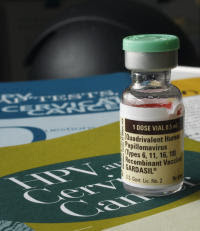 Gardasil is a vaccine designed to fight strains of the human papillomavirus (HPV) that can cause cervical cancer. On average, 9,710 new cases of cervical cancer are reported each year in the entire United States. Deaths average a total of 3,700 per year -- that's for all ages and all 50 states. Unfortunately, I was unable to find the statistics for Texas, but it is safe to say that the numbers are by no means staggering. This vaccine was certified by the FDA in June, 2006, after relatively few tests. Already there have been 82 "adverse events" associated with the use of Gardasil reported to the Center for Disease Control. Side effects include pain, itching, fever, vomiting, diarrhea, dizziness and muscle pain, among others. Doesn't sound all that good, does it? 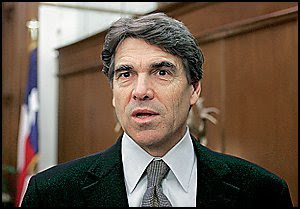 Well, apparently Slick Rick can be bought for a mere $6,000 -- that's the amount Merck, the maker of Gardasil, gave to Perry's re-election campaign. Plus, undoubtedly, promises of lots more under the table where the greenbacks get greased more often than the buggers. At $360 per each three-shot regimen, Gardasil is a potentially huge money-maker, that much is clear. What is not clear are the long-term effects of this drug -- and it is very scary to hear Perry poo-poo such concerns with language almost identical to that of Richardson-Merrill some years ago. The bottom line is that the biggest prick in Texas wants to prick your daughter. Not once, but three times. And you don't have any say in the matter whatsoever.